This test wasn’t a surprise and it isn’t full of new information either. Some of the questions are directly pulled from the previous lessons, while others require students to apply what they have learned to similar situations. As a teacher, it doesn’t feel out of reach, but to some of our students, it may as well be written in a foreign language. Does this sound familiar? “I don’t get it” may even be one of the most common phrases to be heard in a classroom. And while we want students to feel comfortable and speak up when they’re confused, it can become frustrating for teachers. There is a pacing calendar to follow, 24 other students to attend to, and about 65 things on our to-do list. Okay everyone. Before we get stuck in this rut, let’s take a deep breath and recognize this as a learning opportunity. You’ve probably noticed that the frequent flyers of the “I don’t get it” banner aren’t just waving it in one subject area. They find most independent work to be challenging, no matter the content, or the direct instruction that precedes the task. When asked to complete it, they freeze up as though they’ve never seen it before, even if it is a close replica of what was just taught. It may look like the students are disinterested in completing the task, while in actuality they don’t know where to begin. As educators, it is our responsibility to ensure that all students have access to the content. This means that sometimes we need to adapt our own instruction to better support them. If the brain is such a powerful thing, why aren’t we spending more time teaching our students how to use it? When faced with a new challenge, our students must have the capacity to really think it through. We must be explicit and teach them what it looks and sounds like to persevere, even in the face of a challenge. But how? Model: The next time you are grappling with a complex text (or that crazy story problem), utilize your document camera to demonstrate a “Think Aloud”. Be transparent and share the purpose of your thinking with the students, so they know the goal is to replicate it independently. Guide: There are multiple advantages to asking guiding questions. They ensure the student is actively thinking and they allow the student to come to an answer “independently”. Win, win! I personally love the Guided Reading Mode on Common Lit. Prompt: When guiding questions aren’t doing the trick, we must scaffold and using a variety of prompts can be the way to go. Sentence starters and graphic organizers, such as these on Ditch That Textbook, are extremely easy to implement. Repeat: Sometimes, our students just need to hear the information again before trying it on their own. For those who are feeling adventurous, creating a screencast of your lesson is a great way to offer this option to students. Encourage: None of the above will work if we don’t take care of this first. Classrooms must be safe spaces that embrace failure and encourage growth. Check out this post to see how you can make sure this is happening in your classroom. 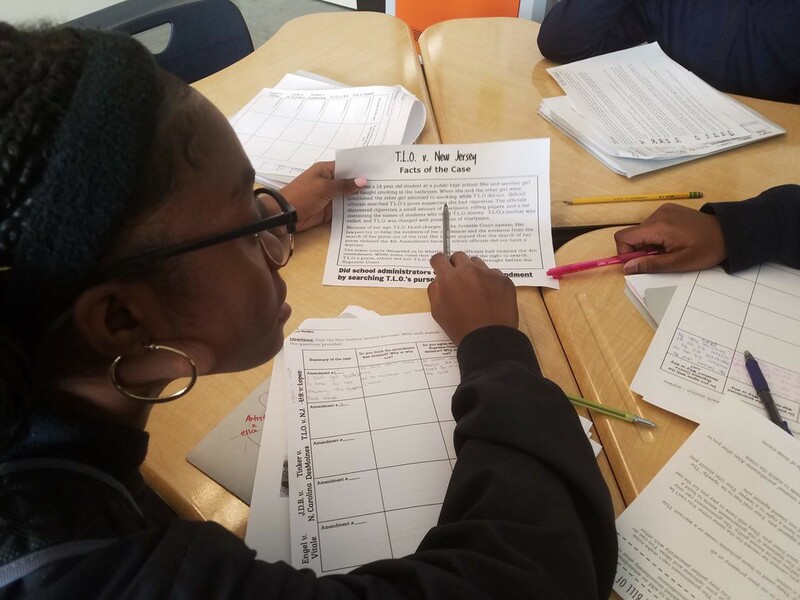 Middle School students utilize graphic organizers to apply their knowledge of the Amendments to the Constitution to a variety of court cases. Even though independent tasks (including assessments) are necessary for learning, it is essential that we continue to support our students when they need us most. If students face challenges only to feel unsuccessful again and again, they will eventually lose motivation altogether. Nicole Conant always encourages her colleagues to, “…give them some success.” While this might look and sound different for each of our students, it will always come back to the power of thought.